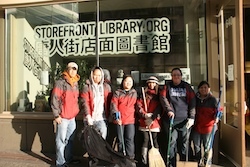 Jason Chou and a group of 8centric volunteers stopped by the Storefront Library as they made their way through the neighborhood on a street clean-up. Jason lives in the neighborhood and is a founder of 8centric, an organization that mobilizes volunteers to address needs in the Chinatown community. 8centric also offers a free evening English conversational class. We gave the 8centric volunteers a brief introduction to the Library, and they swept up our sidewalk on their way out. Nicely done. Great! This seems like a great idea and more people should participate monthly!